Most of us know this scenario all too well: You have a new project to tackle, and you’ve been going over it in your head and imagining how amazing the results will be. You know you’re capable of achieving your end goal because you have high standards and you’ve pushed yourself to continuously evolve and move forward. There’s nothing wrong with setting a high bar for yourself, but if your inner critic has come on a little too strong lately, it'll do more harm than good for your business. In many ways, we’re all perfectionists. After all, who wouldn’t want to be the best possible version of themselves? The problem is, when you become too obsessed with perfection, you end up placing value on the wrong things, which can actually hinder your ability to produce great work. Stanford professor John Perry wrote about this mindset in his famous 1996 confessional essay, "Structured Procrastination," where he explained that once the bar has been set too high, people naturally start putting off tasks because they’re afraid they won't be able to meet those high expectations. But perfectionism is common today simply because we’re taught from an early age that if we work hard enough, we can achieve whatever we want. That push for perfection can help us achieve our goals—but it can also quash our dreams. 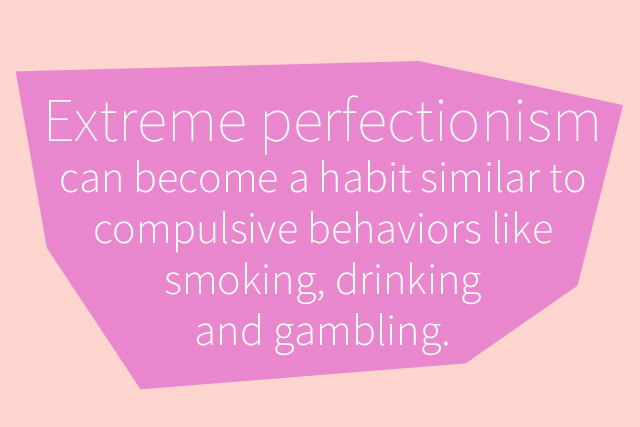 It all depends on what type of perfectionist you are. In 1978, psychologist Don Hamacheck identified two forms of perfectionism: normal and neurotic. According to Hamacheck, the normal perfectionist strives to achieve greatness but doesn’t obsess about it or let it affect their happiness. The neurotic perfectionist, on the other hand, is miserable and often feels fear, shame and worthlessness because their happiness is linked to impossible goals. These neurotic perfectionists have inner critics that castigate them or tell them they’ll never be good enough. If your constant need for perfection becomes obsessive, it can ultimately ruin your career, according to LaRae Quy, a speaker, author and mental toughness coach, who recently wrote about the topic of perfectionism on her website. But how do you know if you're a perfectionist and whether it's helping or hindering your business? These four tips can help you decide. Time is money, and if you’re an avid perfectionist, you’ll likely take twice as long to complete tasks because you’re so focused on making every detail perfect. "Successful people make decisions on how to make the best use of their time," Quy writes. "They do not focus on perfection or being the best; instead, they work on doing what is needed to get the job done." Wasting your time revisiting already completed work will also leave you with less time to pursue other projects. In the end, no matter what profession you’re in, you lose. Instead, you should strive for excellence but also know that perfecting every detail doesn't matter. When you believe every task needs to be completed perfectly, you’ll put in the extra hours you think are necessary. What perfectionists don't understand is that no one expects “perfect” work. Instead, they expect competent work that's completed by the deadline—your extra hours or tweaking and re-tweaking will likely just leave you exhausted without getting any extra attention from your client. Even worse, if you’re too wrapped up in the details of a project, you’re probably missing out on better and more important opportunities. Perfectionists often believe they need to have all the answers. On the other hand, the most successful leaders know that being great means not having all the answers, but finding them. “Resist the urge to be a perfect know-it-all and step back,” Quy writes. “Do not be afraid to respond by probing and asking even more questions, but focus on asking the right questions so the answers will lead you closer to finding success.” In short, admitting when you need help will get you a lot further than thinking you can do it all on your own. The most successful business owners need to be able to think fast on their feet, but perfectionists may pine over a problem because they just can’t risk it not being the best way to get things done. “The desire for perfection will cripple your need to adapt to fast-moving situations where minds need to remain nimble and flexible," Quy explains. Instead of focusing on solving a problem the first time (which is what perfectionists do), the better choice would be to continue trying new things until you find something that works well enough for you. When you’re competing in today’s business environment, there are any number of reasons why you want to achieve excellent results and produce the very best work you know you’re capable of. But as our world spins faster and becomes more innovative, the people who will make it are the ones who continually adapt until they find something that works and the market responds to. When you find yourself obsessing over details that stop you from doing the work necessary to compete, it's time to ask yourself: What do you really gain from being a perfectionist?